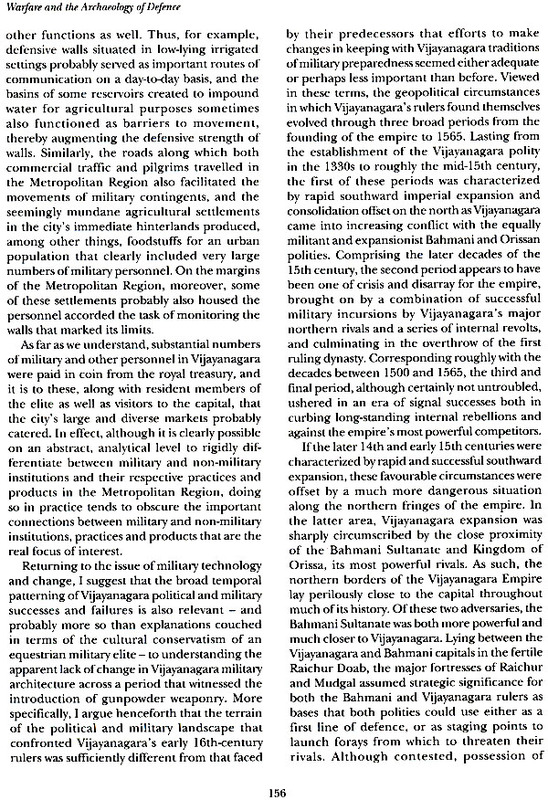 Vijayanagara: Warfare and the Archaeology of Defence investigates those features of the Vijayanagara site that allowed this greatest of southern Indian capitals to function as a fortified citadel, resisting invaders for almost two hundred years, before finally succumbing after the catastrophic battle of January 1565. 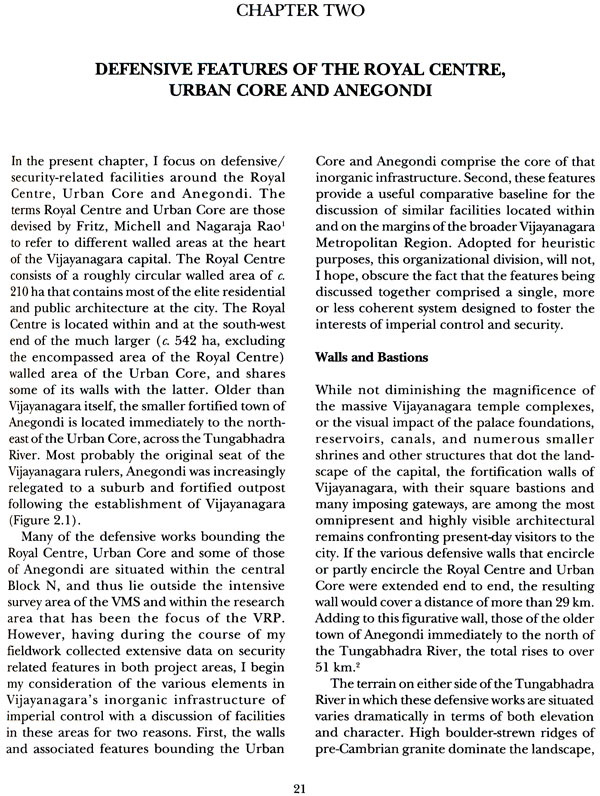 The volume systematically documents the surviving earthen and granite ramparts of the city that are spread over a vast urban area, incorporating the Royal Centre and Urban Core of the capital, and also the twin city of Anegondi. The author's investigation covers walls, bastions and parapets, barbicans and gateways, moats and ditches, all of which achieved an effective system of surveillance and communication. Brubaker subjects these diverse archaeological data to statistical analysis by measuring constructional and formal variations of these features in the different parts of the site using qualitative and quantitative scales. The explanations that he offers for these variations contribute to a new understanding of the functioning of the Vijayanagara site as a military citadel, as well as to the overall development of fortifications in southern India during the 14th to 16th centuries. In particular, the author considers the new strategies of gunpowder and artillery introduced into India at this time, and their seemingly negligible impact on Vijayanagara's fortifications. Brubaker's study, illustrated with photographs, topographic maps, detailed archaeological surveys and statistical tables, makes it the definitive investigation of the subject. Robert P. Brubaker received his postgraduate education in Anthropological Archaeology at the University of Michigan, Ann Arbor, with a dissertation on the Vijayanagara empire. He is currently a lecturer in the History Department at the University of Arkansas. His research interests encompass the historical anthropology of early complex societies and the archaeology and history of Early South Asia. Forts are a common feature of the Indian landscape, and were constructed in all historic periods - Ancient, Medieval and Modern. Lists of different types of forts are given in traditional Indian literature on building practice (shilpashastras) as well as statecraft (for example, the Arthashastra). While ancient forts are not preserved, representations of fortifications are found in sculpture (for example, on the 1st- century CE toranas at Sanchi in central India), and in painting (as at Ajanta in the Deccan in the 5th century). From the 16th century onwards, idealized images of forts and of palaces within fortifications appear in the miniature paintings of the Mughals in northern India. In the 18th century in southern India, military officers of the British East Indian Company depicted hill forts in competent and informative watercolour sketches. Accuracy was greatly increased when teams of surveyors lead by Colin Mackenzie embarked on the Mysore Survey, creating large- scale, carefully measured topographic maps. Accompanying reports included details on the history and customs of the region, while the maps recorded natural and cultural features, including the layouts and settings of forts. In 1800 Mackenzie made the first map of the Vijayanagara site, depicting fortifications as well as roads, topographic features and water bodies with great precision, but rendering temple complexes only schematically. From the mid-20th century, scholars who have investigated Indian forts have taken a variety of approaches. Some have sought ex- amples that illustrate the different categories of forts listed in traditional literature; others have compared and contrasted the plans and defensive components of sites influenced by designs introduced into India by Central Asian invaders from the 12th century onwards. The growing wealth of information on forts from all periods in India has encouraged students to broadly sketch the evolution of fortification design as it responded to new strategies of offensive warfare, such as the introduction of gunpowder and artillery in the 15th century. At the same time, detailed studies of particular forts have been undertaken in order to create typologies of defensive works and to understand their development over time. Robert Brubaker's Vijayanagara Warfare and the Archaeology of Defence advances the research on Indian forts in significant ways. 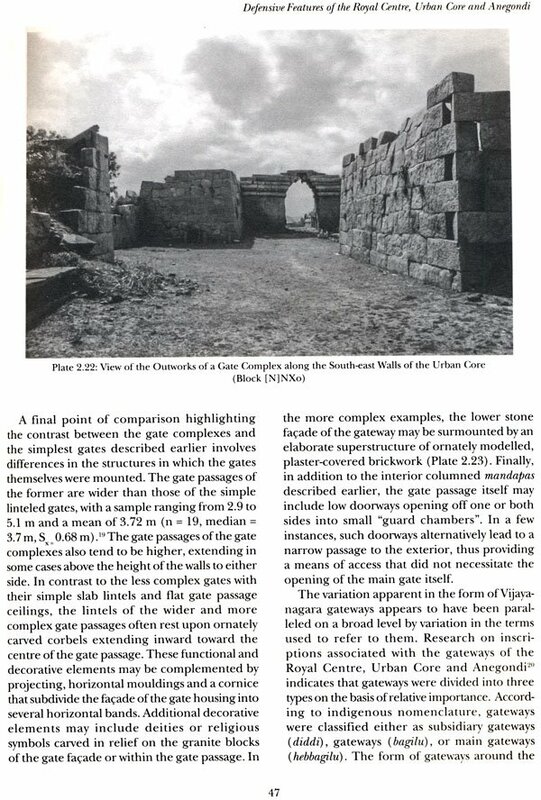 Firstly, the author addresses fortifications spread across the vast urban area of Vijayanagara; secondly, he recognizes that even within particular types of structures, such as bastions, there is variation in where and how they were built; thirdly, the author measures variation using qualitative and quantitative scales, characterizing and assessing these data with statistical procedures; fourthly, the author systematically samples this variation in all areas of the site; and fifthly, he considers several kinds of explanations for the form and disposition of these defensive elements. 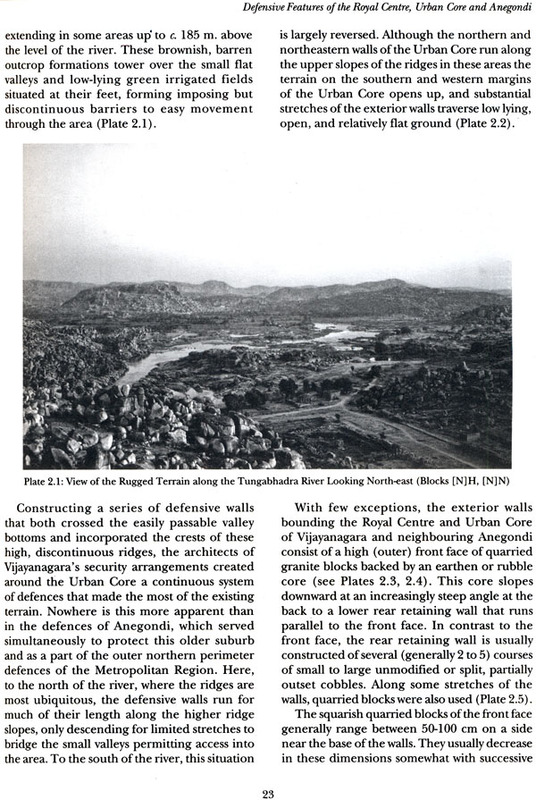 For example, Brubaker examines varying factors that might affect the size and proportion of wall blocks and use of chinking. These factors include the types of structure (walls or bastions) , physical setting, location in the site, inferred period of construction, and relation to other constituents. The author then considers factors such as geology, cost and defensive strategies which may have led to the empirical patterns that he documents. Brubaker also addresses the changing historical contexts in which fortifications were developed. 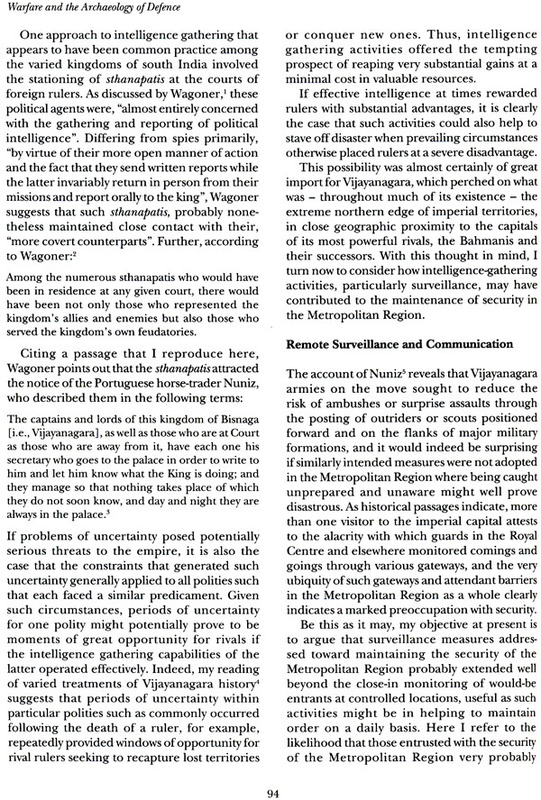 For example, he suggests that 16th-century rulers of Vijayanagara may not have adapted its fortifications to resist weapons using gunpowder, because offensive policies against their enemies were successful, and because capital investment in temple complexes was more pertinent to internal social and political integration. In all these endeavours, Brubaker makes an innovative contribution not only to the study of the Vijayanagara site, but, in a broader context, to the investigation of fortifications in Medieval India as a whole. We are delighted to include this work as the thirteenth volume in our Vijayanagara Monograph Series. Research by the Vijayanagara Research Project and Vijayanagara Metropolitan Survey could not have been taken place without the gracious permission of the Government of India and the encouragement and support of the Karnataka Department of Archaeology and Museums, Dr R. Gopal, Director. Dr Pradeep Mehendiratta, Retired Director General, and Dr Purnima Mehta, Director General of the American Institute of Indian Studies, have steered our projects through well-mapped shoals. As with previous volumes in our Monograph Series we are indebted to Ramesh Jain and Siddharth Chowdhury at Manohar for conscientiously supervising the production and printing. Donations by a number of friends and colleagues have made it possible for us to bring out this volume. To all these individuals and institutions we offer our profound gratitude. Although anthropological archaeologists and historians have long recognized that militarism and warfare are frequently implicated in the rise, maintenance and decline of early states and empires, efforts to better understand the connections between organized violence and the development and decline of these complex polities are hampered by the relative infrequency of archaeological studies focusing on this important issue and the related problem of identifying unambiguous evidence of militarism and warfare in the archaeological record. 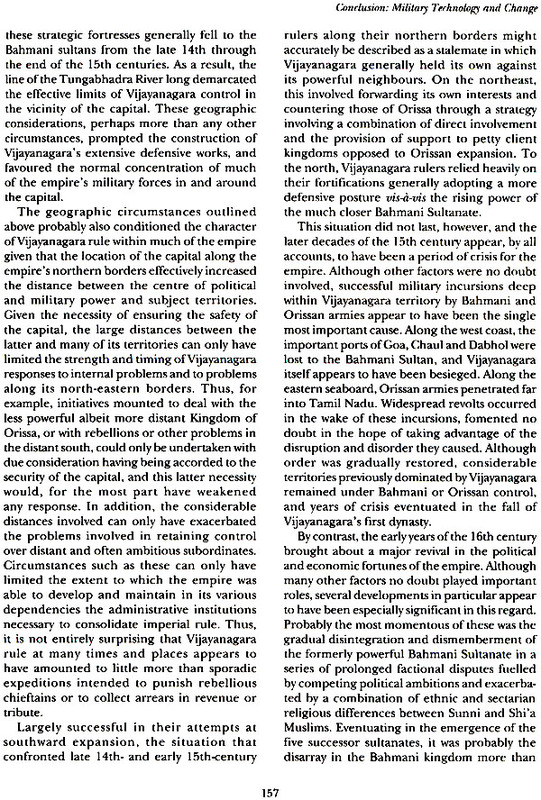 In my PhD dissertation, 'Cornerstones of Control: The Infrastructure of Imperial Security at Vijayanagara, South India', submitted to University of Michigan in 2003, from which most of the data and discussions in this volume are drawn, I attempted to address these and other problems through an examination of the militarism and warfare that dominated the pre-colonial Vijayanagara Empire of south India between the later 14th and early 17th centuries. Revealed as a highly militaristic polity in ubiquitous historical sources, the capital of this empire - the heavily fortified city of Vijayanagara - has also been a focus of extensive and ongoing archaeological research. 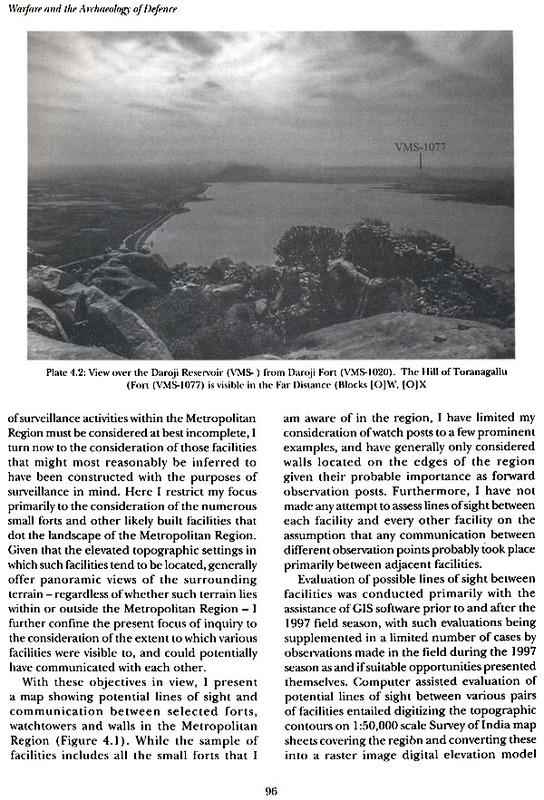 The extensive historical and archaeological materials which underpin this study provided me with a rich context in which to situate the archaeological field data that I collected on the extensive fortifications at Vijayanagara under the auspices of the Vijayanagara Metropolitan Survey (or VMS). My analysis of these field data in relation to this context suggests that material signatures of the kind commonly relied upon by archaeologists to attest to the presence or absence of militarism and organized conflict (e.g., walls, evidences of catastrophic burning, traumatized skeletal remains, and pictorial representations) were generally heavily embedded in the broader landscape of the Vijayanagara capital. As such, important connections were revealed between these signatures and seemingly unrelated aspects of the historical and archaeological landscapes of the capital. While most archaeologists attempting to address questions pertaining to issues of warfare and militarism in south India do not have access to the rich historical contexts available for Vijayanagara, I argue that efforts to address such issues may be enhanced by examining potential signatures of warfare and organized violence within the context of other, seemingly unrelated aspects of the available archaeological record. Throughout this study I have made considerable use of historical sources, including inscriptions, contemporary Indian literature, and the narrative accounts of European and other visitors to Vijayanagara; even so, the core data of this volume is based on the archaeological fieldwork undertaken at and around the Vijayanagara site in 1997. I conducted this research under the auspices of, and as part of, the broader research effort of the VMS. Devised and co-directed by Drs Carla M. Sinopoli and Kathleen B. Morrison, this large-scale archaeological survey has had as its primary object the investigation of land- use and craft production in the environs of the imperial capital. As conceived and now completed, the VMS consisted of a phased, two-part archaeological project: the first part involved the intensive survey of an area of 162 sq. 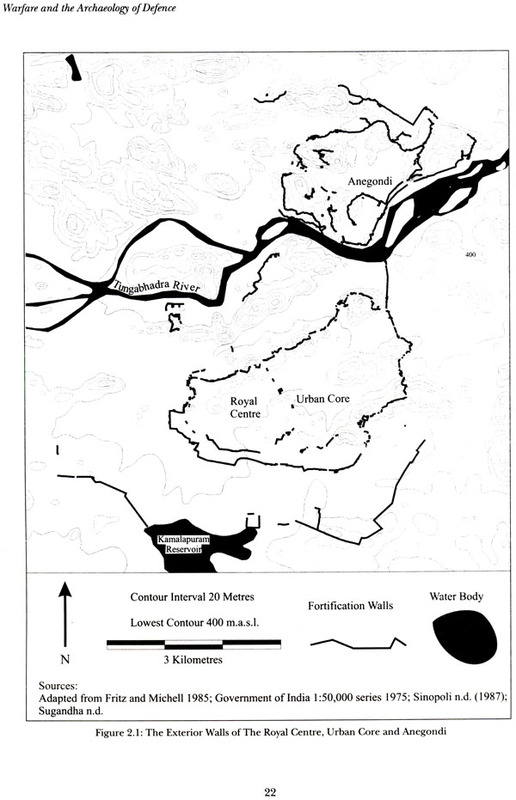 km around the walled Urban Core of the Vijayanagara capital; the second part comprised an extensive survey directed at select sites of particular significance in the larger Metropolitan Region, a rugged area of granite, basalt and schist outcrops of some 650 sq. km. As part of the overall VMS archaeological project, my own field research activities focused on three major objectives. The first involved documenting nine small, previously known fortifications located outside the walled Urban Core of the Vijayanagara capital. Grounded in discoveries made during earlier field seasons and clues gleaned from the accounts of early European visitors to Vijayanagara, the second objective of my research involved an exploratory survey designed to locate evidence of fortifications on the margins of the Metropolitan Region. More successful than anticipated, my exploratory research resulted in the discovery and documentation of eighteen fortification walls guarding the gaps in the steep ridges that define the edges of the Metropolitan Region. My third objective aimed at attaining a better understanding of the sequence of construction of Vijayanagara's many walls, as well as the technology and organization involved. 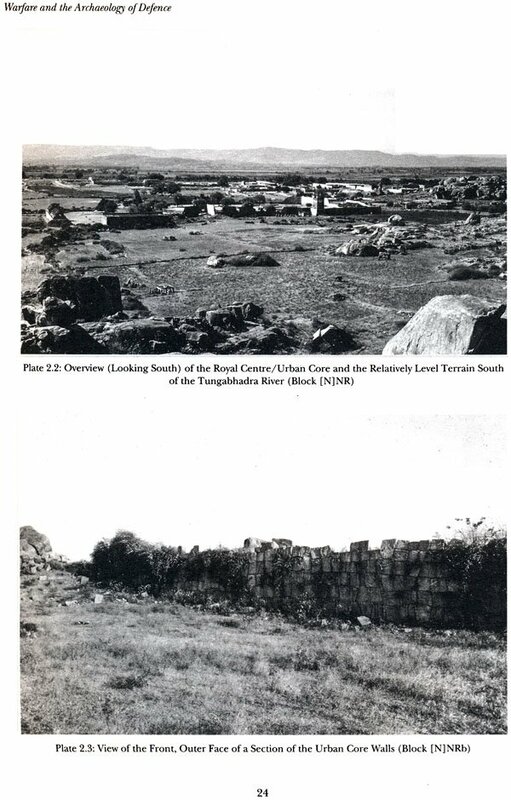 To this end I focused on collecting qualitative and quantitative comparative data on walls and bastions located throughout the Metropolitan Region. 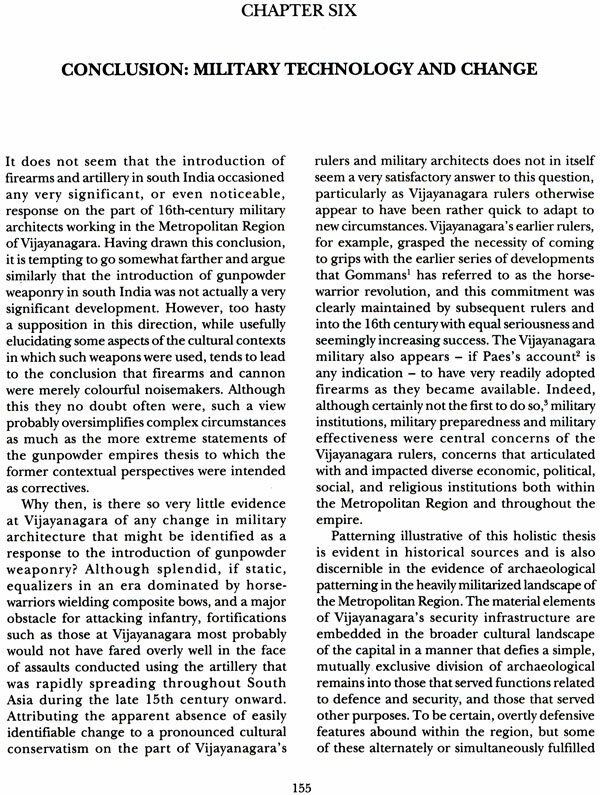 By way of providing a context in which to situate and discuss the data I collected in the field, I present in Chapter One a historical introduction to the Vijayanagara period. The Vijayanagara Empire arose at a watershed in Indian history. Beginning around 1295 and continuing into the first three decades of the 14th century, large-scale military raids by the armies of an expansionist Delhi Sultanate repeatedly penetrated south India. Although the efforts of the Delhi Sultans to consolidate their control over the south collapsed in rebellion, their military incursions left the established peninsular kingdoms either seriously destabilized or in ruins, thereby paving the way for the rapid and near simultaneous rise of a series of new polities that would henceforth occupy the centre stage of south Indian history. One of these polities was Vijayanagara. In tracing the course of Vijayanagara history from its founding around 1336 through its decline and final dissolution in the decades following the disastrous defeat of the Vijayanagara military and sack of the imperial capital in 1565, I consider what historical sources reveal to us about the nature of militarism and military institutions during the Vijayanagara period and emphasize the important extent to which major geopolitical considerations shaped the growth and character of the empire (and by extension the growth and character of its first and greatest capital). Touched on above, the abortive attempt by the Delhi Sultans to incorporate peninsular India within their empire clearly facilitated the subsequent rapid expansion of the Vijayanagara Empire. At the same time, however, the partial collapse of the Delhi Sultanate also paved the way for the near simultaneous establishment (c. 1347) of the rival Bahmani Sultanate in close geographic proximity to Vijayanagara and with competing claims to the territories situated between the capitals of the two polities. Located some distance away, a third, equally expansionistic polity, the Ganga (later Gajapati) kingdom of Orissa, was a third important player in this emerging geopolitical landscape, a landscape characterized by chronic warfare and competition. 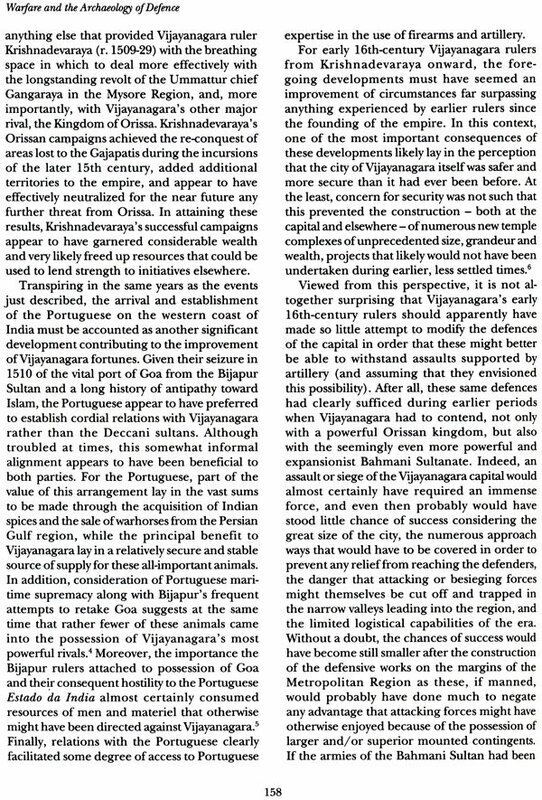 In Chapter Two I turn my attention to an account of the basic components in the system of defensive works that protected the heart of the Vijayanagara capital. 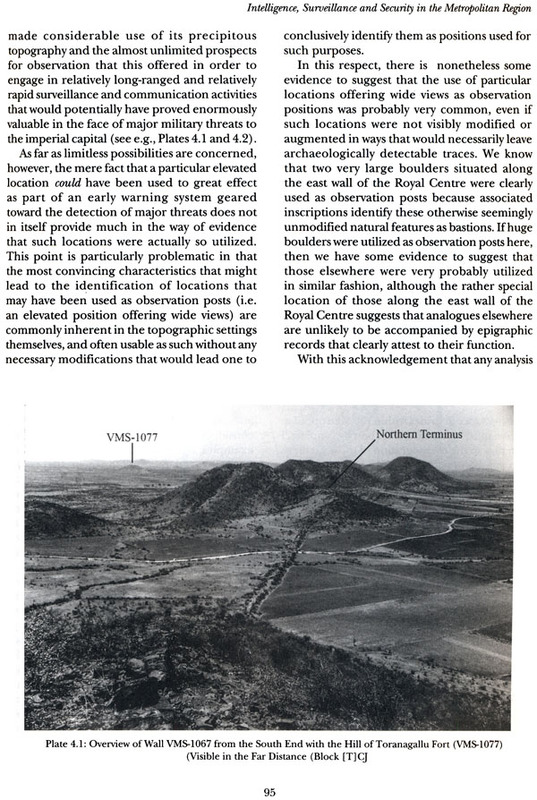 Here I consider both that triple line of concentric and part- concentric defences commonly referred to by archaeologists as the Royal Centre, Inner and Outer Urban Core, as well as the multiple walls of the older town of Anegondi located immediately north of Vijayanagara across the Tungabhadra River. 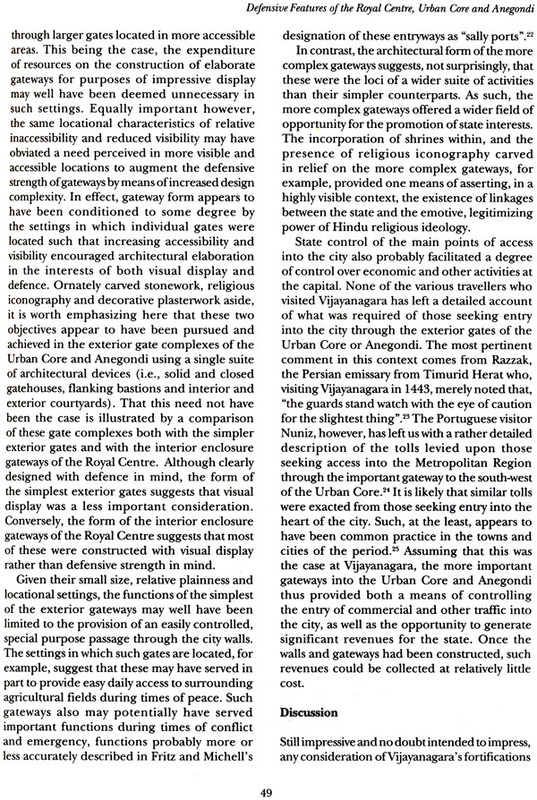 Partly a general overview and description of the city's walls, gateways, bastions, ditches and other obstacles, my discussion is also very much an argument as to why these features should be regarded as serious fortifications rather than merely the showy props of a theatre state. In formulating an argument to this effect, the question naturally arose as to what kind of evidence would lead archaeologists to identify such structures in military terms if it were the case that existing historical accounts supporting such an interpretation were not available. My answer to this question essentially involved inferring intended function from form, and explicit application of this criterion generally confirmed my prior positive opinions with regard to the defensive function of most of Vijayanagara's many walls. 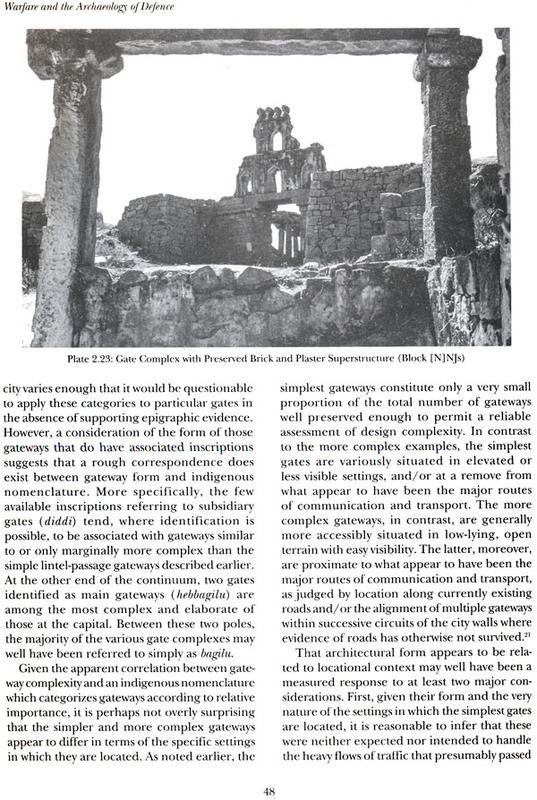 Interestingly, however, this same criterion also led me to conclude that the highest extant walls at the capital (i.e. those of the numerous large enclosures located within the Royal Centre walls) were almost certainly intended to demarcate elite social spaces rather serving the purposes of serious defence. 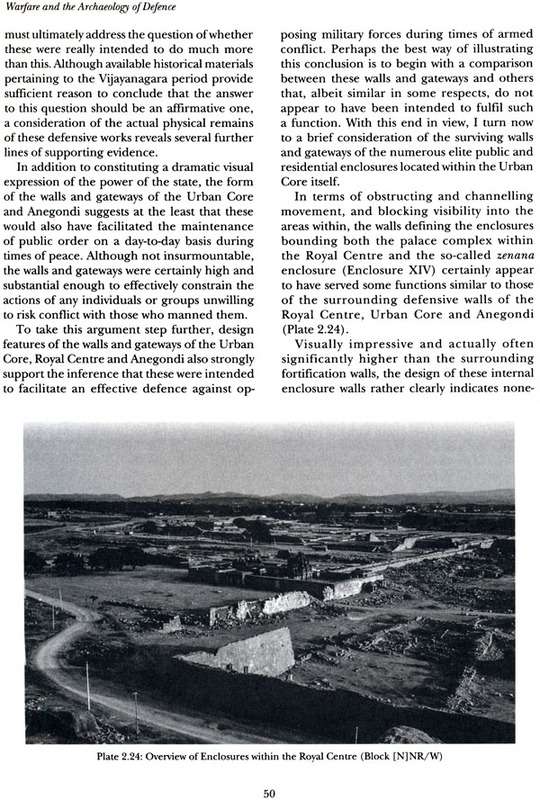 Lacking the projecting bastions, complex gateways, interior parapet walkways and generally heavy earth-backed construction that characterizes the walls of the Royal Centre, Urban Core and Anegondi, the higher walls of the enclosures within the Royal Centre would have provided few, if any, defensive advantages to those sequestered within. The largest and most enduring polity to arise in south India before the advent of British rule, the Vijayanagara Empire dominated much of the peninsular region between the later 14th and early 17th centuries. That this empire - like its neighbours, predecessors and successors - was an expansionistic and militaristic polity there can be little doubt. Whether written in Persian, Portuguese or in one of the Dravidian languages of the peninsula - Kannada, Tamil, Telugu - accounts of militarism and warfare figure prominently in the extant historical materials attributable to the Vijayanagara period. Although these primarily record donations to religious institutions, references to warfare and militarism also occur in the literally thousands of Vijayanagara period stone inscriptions that have been documented throughout south India. Located along the Tungabhadra River in the semi-arid uplands of what is now the State of Karnataka, the heavily fortified imperial capital of Vijayanagara has been the focus of long-term archaeological research both by the Archaeological Survey of India and the Directorate of Archaeology and Museums of the State of Karnataka. In addition to the conservation activities and extensive excavations of royal and elite residential areas undertaken by these agencies, the city of Vijayanagara has also been the focus of investigations by the Vijayanagara Research Project (the VRP). Led by John M. Fritz and George Michell, VRP research efforts extending over two decades have been directed toward the detailed documentation and mapping of architectural and surface remains in the core areas of the city. Finally, Vijayanagara has also been the site of research activities by the Vijayanagara Metropolitan Survey (the VMS) . Co-directed by Carla M. Sinopoli and Kathleen D. Morrison, the research efforts of the VMS have involved the completion of a large-scale systematic archaeological surface survey - the first of its kind in India - of the immediate hinterlands of the imperial capital. The data that I collected in the field under the auspices of the VMS provide the primary basis for this study. With respect to archaeology and issues of warfare, militarism and imperial control, archaeological remains at the capital include ubiquitous examples of many of the kinds of material remains commonly interpreted by archaeologists as signatures of violent, organized conflict. Protected by multiple lines of fortification walls, over 50 km of which survive today, several historical sources none- theless indicate that Vijayanagara was sacked in 1565, and it is a reasonable interpretation that evidence of widespread and catastrophic burning encountered during excavations in royal and elite residential areas of the city is attributable to this development. Occurring on several monumental public structures are sculptural friezes depicting mounted and un- mounted soldiers in procession and, in one instance, seemingly in battle. Finally, although clearly more equivocal, jumbled human and animal remains encountered in an enclosure near the heart of the city may also relate in some way to the circumstances surrounding its demise.' Significant in themselves, the foregoing material remains are among those most commonly interpreted by archaeologists as signatures of violent conflict in the absence of historical contexts. 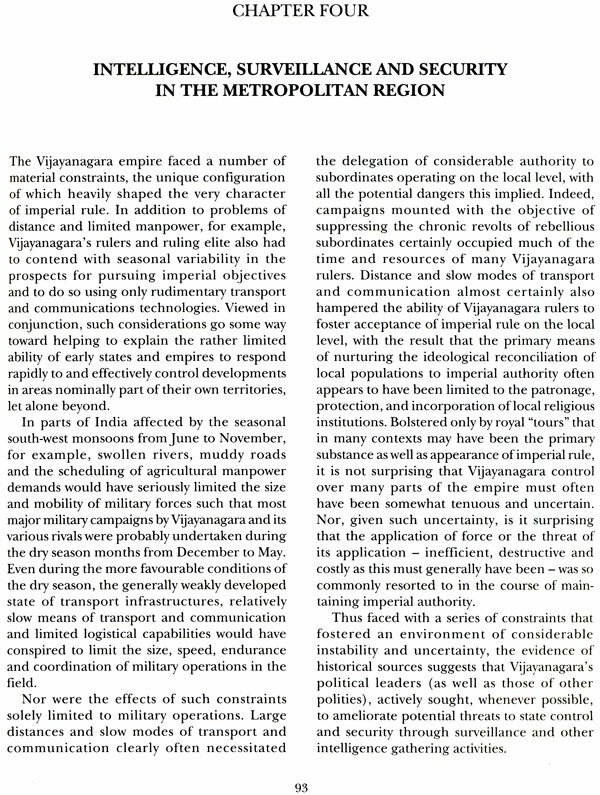 The real value of Vijayanagara as a case study of early state militarism, however, lies precisely in the rare opportunity to holistically situate this important phenomenon within its broader societal context, an opportunity afforded by access to the rich historical and archaeological resources outlined above. The undertaking of this task is the primary focus of this volume. As many historians have argued, the last years of the 13th century and the early decades of the 14th century were a developmental watershed in the history of south India." As had long been the case, the peninsula was divided at this time into a series of regional kingdoms of varying stature and extent. On the north-west, the Yadava dynasty of Devagiri ruled an extensive area in what is now the state of Maharashtra, while on the north-east, the Kakatiyas of Warangal claimed dominion over similarly extensive regions of what is now Andhra Pradesh. Based in the dry and rugged uplands of what would become the state of Karnataka, the rulers of the Hoysala kingdom actively sought to expand into the south-eastern lowlands of Tamil Nadu, the core area of the once powerful Chola Empire of the 10th-12th centuries. Newly resurgent in the wake of the Chola decline, the more southerly portions of Tamil Nadu were ruled by the Pandyas. Located on the margins between these major kingdoms, the rising polity of Kampili occupied areas that soon would become part of the heartland of the empire that forms the focus of this study." Along the eastern seaboard, the Ganga Kingdom of Orissa controlled territories commensurate to those of the modern Indian state of the same name. Like their predecessors, the regional kingdoms of the peninsula were characterized by periods of alternating coexistence and chronic political and military competition." None were prepared, however, for the adversaries who would soon descend upon them. Initially established around 1206 as what would become the first Islamic polity centred wholly within the subcontinent, the empire known to history as the Delhi Sultanate had expanded somewhat fitfully thereafter to become the dominant power in northern India by the end of the 13th century." Throughout this period the expansionist military expeditions of the sultans and their lieutenants focused primarily on the Ganges basin of north India and areas immediately to the south on the borders of Rajasthan. Seemingly driven in large measure by the prospect of seizing control over the resources of the various wealthy Hindu kingdoms of north India, the large scale mounted raids of sultanate armies generally conformed to a progressive pattern in which initial predatory expeditions against the latter kingdoms focused on the capture of movable wealth, with later campaigns directed toward the gradual incorporation into the sultanate of polities weakened and destabilized during earlier raids. Sometimes carried out over decades, the timing, tempo and objectives of such progressive expansionism were heavily conditioned by the need to defend the sultanate against the serious and ever-present threat of large scale raids by the Mongols, whose expansionist tendencies and skill at equestrian warfare rivalled that of the sultanate armies themselves. Although the progressive pattern of sultanate expansionism remained largely unchanged, its geographic focus shifted dramatically in 1296 with an unsanctioned raid far to the south that presaged what was to come for the kingdoms of the peninsula." Seemingly inspired in large measure by the dynastic ambitions of soon-to- be-sultan 'Ala' al-Din Khalji (r. 129&-1316), the target of this raid was Devagiri, the capital of the Yadava kingdom, which was captured by surprise along with its king Ramachandradeva." Enormously lucrative, this first raid on Devagiri paved 'Ala' al-Din's path to the throne and inspired additional expeditions farther afield using the weakened Yadava kingdom as a base of operations. Conducted over roughly three decades from 1296 to 1327, subsequent military expeditions repeatedly and alternately targeted the Kakatiya, Hoysala, and Pandya kingdoms, with later raids also impacting the nascent kingdom of Kampili, and the Ganga kingdom of Orissa (Figure 1.1). Of the aforementioned kingdoms, only Orissa escaped marked destabilization, annexation or outright destruction. The last to fall was the kingdom of Kampili, whose capital of Kummata was finally sacked in 1327 after several unsuccessful attempts. Historical sources report that huge quantities of movable wealth were shipped back to Delhi in the wake of sultanate military campaigns in the south and elsewhere. Extracted from both temples and rulers, plunder and/or tribute generally included massive quantities of gold and other precious metals." Significantly, the resources appropriated by the armies of the sultans also usually included large numbers of elephants and warhorses.